Hello folks who always accompany us, are they looking for new patterns to increase their knowledge? Here is the place. We have many patterns here on our website, if not seen runs take a look at our patterns, we have many cool things as various models of children dresses, blankets, carpets, quilts, sweaters, shawls, amigurumi, separate points for doing what I want to be among many more, I'm sure you'll love it. We have patterns for all tastes and wants. Today I bring a beautiful and comfortable pattern for you and it is also very useful, I'm sure you have seen patterns of shoes somewhere because it is very common but if you still do not know how to make crochet shoes this is the time to learn and do several for you and also give as a gift. Let's increase our knowledge and taking care of the requests I brought to you who asked for this tutorial on how to make a crochet shoe. Enjoy and use the creativity and make the color you prefer and like, so come on and enjoy this crochet tip. With a rain and cold we should warm ourselves to not get sick with temperature dropping. I do not like the cold very much, I prefer the warmth but I like the clothes and I think it's good too because I can use different models of coats, shoes and crochet shawls that I love and give an elegant look. So everything has the good side of things. When the cold is coming we should be prepared, and the way we put our hooks and wires to work and make beautiful pieces to warm us in winter and also to sell and warm our customers. In recent days I have been researching about winter pieces and I loved this idea that there are at one time making crochet shoes for adults and they make the most success on the internet. Crochet shoes are always in the trends of the winter season. The shoe is very comfortable for our feet and we can use it to stay at home or for a walk too, why not, not really .. because they are very comfortable and beautiful. Comfortably and charming to stay at home and still warm us up in the winter. They are comfortable and keep us warm, plus the best of all is that they are super easy to make. I myself feel very cold on the feet, sometimes even covered with I get my feet cold and these shoes are very useful for me to keep them warm, even sleeping with them. They became an indispensable part of my day-to-day life. 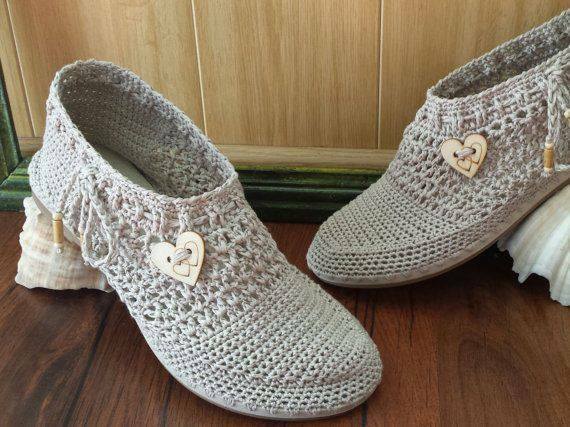 I have seen that these crochet shoes have made a great success and for people who do crochet to sell it is important to make patterns that are successful like this, so do not miss this tip today. Use your creativity and decorate as you wish with other appliques as well. Choose yarn color and workmanship. For you who asked for this pattern or you liked it and found it interesting as well so I would like to take advantage of this tutorial that I leave for you below, a video tutorial with the step by step to make these beautiful shoes. Enjoy our fanpage Xell Crafts and up to the next pattern.